It’s a Tuesday night, and a small crowd packs into the upstairs room of The Rose Villa Tavern in the Jewellery Quarter. A mismatched array of chairs fills most of the space, as well as a projector that hangs from the ceiling… and I am confused. Director and animator Louis Hudson, alongside writer and producer Ian Ravenscroft, stand before the crowd and explain that they will be showing a mix of their own collaborations, along with shorts that have inspired and influenced their work. 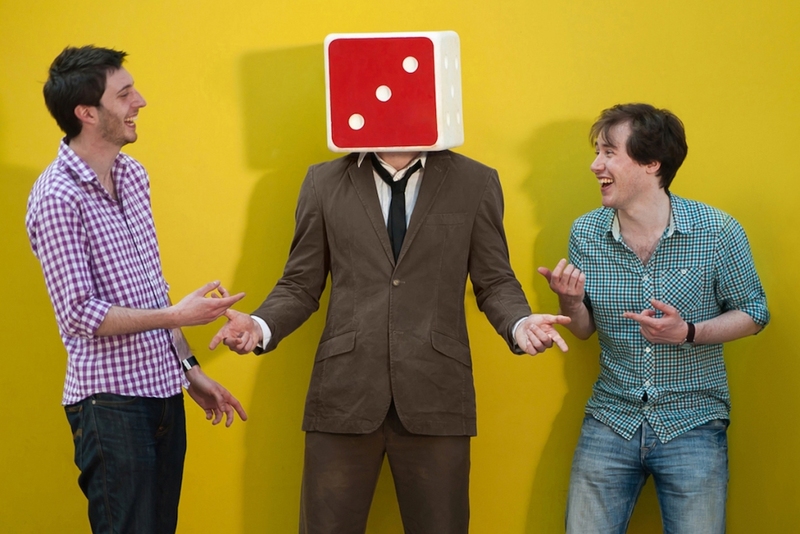 The duo make up Dice Productions – a company that boasts an extensive and award-winning body of work, with their comedy shorts and animations appearing on Nickelodeon (DuckManBoy), Channel 4 (Gregory is a Dancer) and the BBC. The premise is simple enough and this is not what causes my confusion, but rather the eclectic content. The evening opens with Dice Production’s catalyst, Message in a Bottle (2009) – a one minute animated short based on a drawing that Hudson created when he was around sixteen. This, along with the next couple of shorts, did nothing to aid my journey of understanding. The confusion grew to bewilderment, as my brain struggled to catch up and make sense of what I was (admittedly, excitedly) watching. I carried this dilemma with me until the fifth piece, entitled All Consuming Love (Man in a Cat), a nine-minute short, unsurprisingly about a little man named Yorkie (voiced by Kevin Eldon) navigating life stuck in the body of a household cat. At this point, I realised that I had to shove any preconceived notions aside. Usually when watching something I need time to process my thoughts, to establish an explanation before moving on. However, the format of the evening – showing shorts one after another in quick succession – just does not permit this. So, after battling with myself I surrender to the ‘just-go-with-it’ mentality, which is the point and made for an extremely entertaining evening. Although all of the shorts’ comedy is uncontainable and indescribable, the first section is darker and more twisted, including Who I Am And What I Want (2005 – directed by Chris Shepherd and David Shirgley) and Myszochujek (2014 – directed by Kristof Babaski). Part two features assorted clips, starring Morecambe and Wise, Reeves and Mortimer and the cast of The Fast Show – creators who took a medium and distorted it to work against its predetermined rules. This is reflected in The Christmas Card (1968 – directed by Terry Gilliam), which played with the repetition of TV and its traditional conventions long before they were established, allowing a comedy format to be created; a short ahead of its time. Rejected (2000 – directed by Don Hertzfeldt), is also in this section and demonstrates the deeper, more emotional side of comedic shorts. Rejected is a fictional frame story, where Hertzfeldt is commissioned to animate different commercial and television network segments, all of which are ultimately met with rejection. His characters run amuck, and when the intertitle states that the animator has suffered a mental breakdown his work begins to fall in on itself whilst he kills his characters. This could be described as black comedy at a glance, but once you explore the serious implications it demonstrates how much effort, time and dedication go into these works. The final section of the evening focuses on a more child-friendly narrative, comprising of clips from children’s shows such as Danger Mouse (1982), Brillso Brothers (2008) and Hudson and Ravenscroft’s own work, DuckManBoy (2015). Despite the child-like qualities of these works, they still contain absurdities. I have seen a handful of these clips before, but never thought to analyse or breakdown their comedic properties. This is echoed by Ravenscroft, who states that we often don’t think about how much work goes into shorts and may dismiss them as “throwaway comedy”. A great example of this is the side-splittingly funny Morecambe and Wise: The Breakfast Sketch. Hudson points out that someone will have taken the upmost time and care creating bizarre props, including a bespoke fridge that mimics the lights in a cabaret, all for a short clip. This is reflected in their own work, Croissant (2015), which Hudson explains took around five months to make, to ensure that everything was in place to land the desired comedic effect. And the short is only two minutes long. He explains this could have been done easily over a weekend using animation, but stresses the importance of picking the correct format to convey comedy – hence the choice of a ‘live’ short, despite the laborious hours. This particular discussion is nothing short of inspiring in itself, really opening my eyes to each clip and making me appreciate how much effort goes into each frame. My personal highlight of the evening is the segment about English comedian Rik Mayall, who is one of the first comedians I was introduced to growing up. In part two, they show a clip from Bottom (1992) and this preludes Dice’s own work Don’t Fear Death (2013) also starring Mayall as the main voice over, with Ed Bye (director of Red Dwarf 1988-91, 1997-99) as Associate Producer. The duo agree they felt they had successfully captured all sides of Mayall in the three-minute short, released three months before his death. Hearing Hudson and Ravenscroft talk so candidly about the actor, his mannerisms and genuine character, is uplifting and makes the short so much more enjoyable. As well as feeling inspired, I come away from Dots & Loops #5 feeling educated by Louis Hudson and Ian Ravenscroft’s reflective, personal knowledge of the clips and the comedy world in general. For example, the Dice Production duo’s discussion of how repetition in comedy affects its audience is perfectly demonstrated through the four-minute Lesley the Pony Has an A+ Day! (2014). And their thoughts on the changing landscape of comedy shorts is fascinating; Ravenscroft explains that the third clip shown, A Heap of Trouble (2001 – directed by Steven Sullivan), was commissioned and aired on Channel 4 but suggested that today it wouldn’t fit a late-night slot, although may achieve millions of hits online. They discuss the changes in YouTube algorithms which make it harder to find new and inspiring content, raising interesting questions regarding the changes in formats and mediums in which comedy shorts operate and are distributed. So, in an attempt to summarise the immensely enjoyable and eye-opening event… I was expecting to passively observe the shorts shown, as I felt I wouldn’t be able to appreciate them individually in such a short time. However, once I had wrapped my head around the unrelated narratives, it was an interesting event to be part of for many reasons – I learnt something new, was exposed to new content, and felt the importance of creativity reaffirmed. Dots & Loops’ fifth edition also demonstrated that whilst there are absurdities and idiosyncrasies, no work is completely original; you will be able to relate it to something prior or see where the artist’s influence has come from. It also showed how genres develop and modify over time, adjusting to modern factors. Shows like Bottom may look dated these days, but you can still break down work to see what it is that makes it entertaining. It’s then up to artists to take and develop this into something new and exciting that works within their own ideologies. And that’s exactly what Dice Productions does.